To prepare your accessories, wash them thoroughly in the dishwasher or in hot water and soap. Keep the dispenser top off of the soap container and set it aside. Remove the labels from the soap dispenser and any that might be on the cup. Remove the sticky residue from the place where the label was affixed with nail polish remover and cotton balls. Remove the paint from the cup with nail polish remover and cotton balls. Rinse them off again and let the dry completely. Lay some newsprint out in a well ventilated area and place the cup upside down on the paper. Spray paint the cup completely without moving it and let dry. Next, hang the soap dispenser on the dowel by placing the dowel into the opening of the soap dispenser. Now you can spray paint the soap container in a well ventilated area. Then, set the other end of the dowel into a bucket so that the dowel stands up and the container will not touch anything while it dries. If necessary apply a second coat of paint to each item and let dry completely. 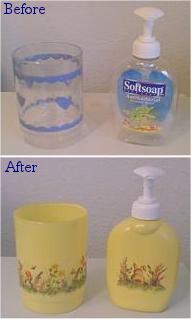 Apply decals to the soap container and the cup. Follow the same directions above for painting the soap container and the cup, but this time, spray them with clear acrylic sealer. You could also do this for the Kitchen. Inexpensive gift idea.